Auguste Schoy [1838-1885], Antwerp (Lugt 64); Théodore-Charles-Louis Hippert [1839-1919], Brussels (Lugt 1377); (sale, Galerie R.G. Michel, Paris, 10 May 1975, no. 14); Mr. and Mrs. Robert P. Mann, Ruxton, Maryland; Mr. Stewart Mann, Ruxton, Maryland. Building a Collection, National Gallery of Art, Washington, 1997-1998, no. 121. 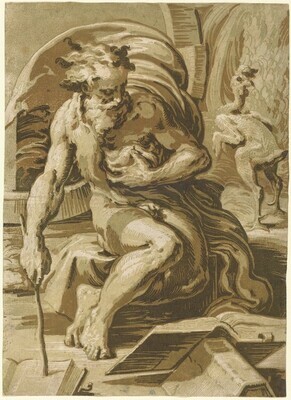 The Chiaroscuro Woodcut in Rennaissance Italy, Los Angeles County Museum of Art and National Gallery of Art, Washington, 2018-2019, no. 24.